The Boston Bruins and Dallas Stars brought fireworks to the NHL on July 4. Boston and Dallas agreed to a seven-player trade Thursday, with the Bruins sending forward Tyler Seguin, forward Rich Peverley and defenseman Ryan Button to the Stars for forward Loui Eriksson and three prospects (Joseph Morrow, Reilly Smith and Matt Fraser). "I think the big thing that people need to realize is we're talking some pretty good players here. I know Tyler Seguin is a big, big part of this trade, a big name plus Peverley, but Loui Eriksson from our end is a very good player and probably a little bit hidden down here in Dallas. Boston knew that, and they knew that he's a big piece of their puzzle, and I know he's going to be a big hit for Boston going forward." Seguin, 21, was the second pick in the 2010 NHL Draft. He has 56 goals and 121 points in 203 career games, including 29 goals and 67 points in 2011-12 and 16 goals and 32 points in 48 games in 2012-13. He had one goal in 22 Stanley Cup Playoff games in 2013 but was second on the Bruins with 70 shots on goal. "Tyler is a dynamic player that will be a part of our core group for a long time to come," Nill said. "A player at his age, position and talent level are extremely difficult to acquire, and we're thrilled to bring him into our organization." 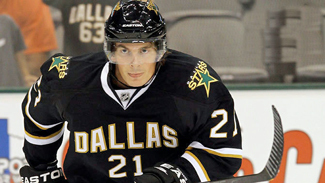 Eriksson, who turns 28 this month, had 12 goals and 29 points in 48 games for the Stars in 2012-13. He appeared in the 2011 NHL All-Star Game and is considered one of the most underrated players in the League. He had at least 26 goals and 71 points in each of the previous three seasons and is one of the top defensive wings in the NHL. "He's a good two-way player," Bruins general manager Peter Chiarelli said of Eriksson. "He knows where to find the spots and score. [He] has a good shot, good release from either side. ... He spreads out your power play. He's fast and a good two-way player. There's a lot of his game that fits into how we play." The draft pick Boston used to select Seguin was one of three the Bruins obtained in a 2009 trade from the Toronto Maple Leafs for Phil Kessel, along with picks used to select defenseman Dougie Hamilton and forward Jared Knight. Bruins general manager Peter Chiarelli made some strong comments about Seguin to the Boston Globe on the day of the 2013 NHL Draft (Sunday at Prudential Center). "He's got to commit his mind and focus on the one task at hand," Chiarelli said. "He's got to become more of a professional. And you know what? I can say that about a lot of 21-year-olds. I know he got criticized for playing on the periphery and all that stuff. He did. He's got to commit to being a professional and focusing on the game. He does that, we don't expect him to be crashing and banging. Just play your game." Seguin is set to begin a six-year contract in 2013-14 that has an average annual value of $5.75 million. Eriksson has three years remaining on a deal that counts $4.25 million per season against the salary cap. Peverley, who turns 31 Monday, had six goals and 18 points in 47 games during the 2012-13 season. He had two goals in 21 playoff games. He was a key figure in the Bruins' 2011 championship, joining the club during that season in a trade from the Atlanta Thrashers then contributing 12 points in 25 games during its run to the Stanley Cup. Peverley started on the third line but moved to the top trio when Nathan Horton was injured during Game 3 of the Final against the Vancouver Canucks. "Rich is an extremely reliable center that is great in the faceoff circle and will help us as a puck-possession team," Nill said. "Being able to add two centermen in this deal will solidify a very important position, while allowing Jamie Benn to return to his natural spot at wing." Morrow was a first-round pick (No. 23) by the Pittsburgh Penguins in the 2011 NHL Draft. The defenseman was acquired by Dallas before the 2013 NHL Trade Deadline in exchange for Stars captain Brenden Morrow. Smith was a third-round pick (No. 69) by the Stars in the 2009 draft. The forward had three goals and nine points in 37 games as a rookie in 2012-13 for Dallas. He was an elite scorer in college, with 58 goals and 102 points in his final two seasons at Miami (Ohio). Fraser, 23, signed as an undrafted free agent for the Stars in 2010. The forward has scored 70 goals in the past two American Hockey League seasons combined, and has one goal and two points in 13 NHL games. Button, 22, was a third-round pick (No. 86) by the Bruins in 2009. The defenseman had no points in 30 games in 2012-13, which he split between the AHL and ECHL.